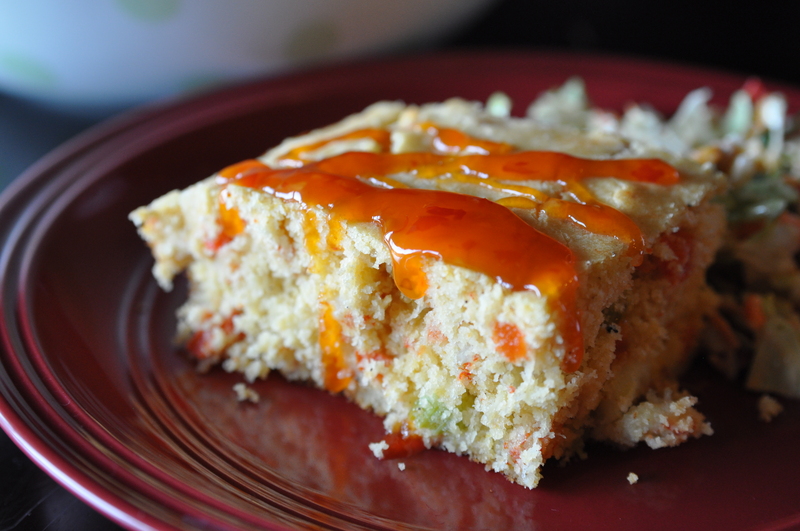 Crawfish Cornbread – Mama, Can I Lick the Spoon? Whenever I’m working on a new recipe, I try not to announce it to the family. I mean, “Hey, guys! Here’s something new! Tell me what you think!” is the worst way to introduce new food to the tribe. They will instantly begin to moan about the one kitchen disaster that haunts me to this day. Is it the time a teenaged me stuck a serrated butcher knife all the way through my hand while foolishly using it to separate frozen hamburger patties? Nah. Child’s play. Is it the time a newlywed me used a wedding gift of pear preserves to make a pear cake so terrible that not even the cat – who had been known to eat garbage on a regular basis – would touch it? Nope. Too easy. No, this one happened when I was writing my cookbook and creating new recipes for it. The name alone causes me to bristle. Tender orzo, roasted vegetables, tart lemon-lime vinaigrette. It was wonderful. I had tasted each component. I had added a touch of salt. I loved it! My family waited expectantly at the table. They always argue over who gets the beauty plate. Well, this time, everybody got the beauty plate. I had used a ring mold to make the perfect, pretty portion of orzo salad. I had sliced the chicken breasts into perfect slices, fanned out around the salad. I proudly set each plate before the members of my family and took my place at the end opposite from Michael. He blessed the meal with a simple prayer of grace. And everybody dug in. I closed my eyes to savor the first delicious bite of the salad. Ugh! Why does it taste like that? It tastes like Pledge furniture polish! I was shocked. I tasted my salad and found it delightful. A little tart. A little savory. Caramelized roasted vegetables. Tender orzo. What is wrong with these people? In twenty years of marriage, this had never happened! Well, except that pear cake, but that hardly counted in this situation. They forced me to order pizza against my will!! So I did what any mature grown-up would do. I ordered pizza and when it came, I watched them ooh and ahh over the stringy cheese and gloopy sauce – while I sat stone-faced and defiantly ate my Citrus Orzo Salad. Yes. Citrus. Orzo. Salad. It is my Waterloo. I’m not even sure that means. But rest assured, I have NEVER made it again. That was five years ago. Five. And they still bring it up. During dinner, on road trips, on the way to church, while we were driving up the side of a mountain in Tennessee. They feel the need to remind me about my gigantic failure. So now, when I’m introducing a new dish, I don’t announce it. I just blindside them with it. Last night was one such night. I made a new dish, made a big salad to go with it, plated it just so, took a picture, and kept the beauty plate for myself. I let everybody else make their own plates while I put ice in glasses. Then we sat down and Michael asked, “Is this something new?” Not an unusual question in our house. Instead of answering, I smiled and asked him to pray. After the blessing, they dug in. And loved it! 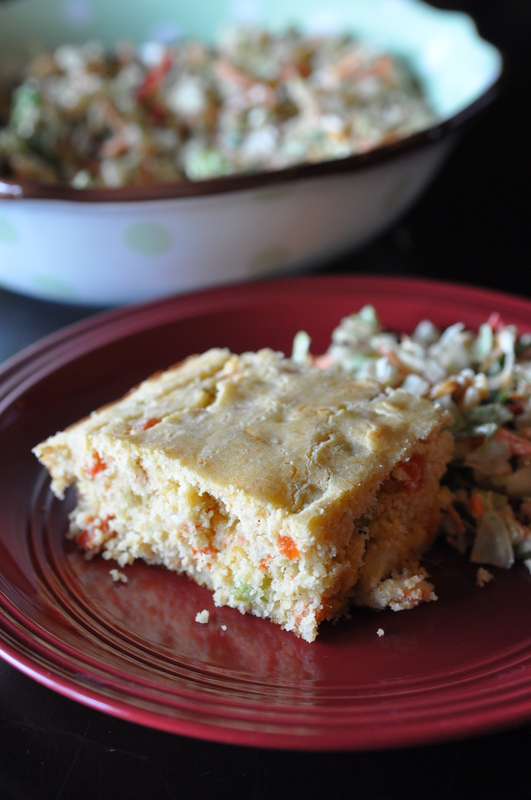 Crawfish tails and sauteed vegetables stirred into classic cornbread. I served it with pepper jelly on top and a big chopped salad on the side. It was everything I hoped it would be. In a large skillet, drizzle olive oil and add vegetables. Sautee over high heat until vegetables are tender and slightly caramelized. Add the butter to the pan. After butter melts, add crawfish tails. Add salt, pepper, and Cajun seasoning. Cook until heated through – 2-3 minutes. Remove from heat and set aside. Pour one tablespoon of vegetable oil into a 9X13 metal baking dish and place in the oven. In a large bowl, combine cornbread mix, eggs, and buttermilk. Stir or whisk until combined. Add cheese and salt and mix. Add the crawfish mixture and stir to combine. After 10 minutes, remove the pan from the oven. Pour cornbread batter into the pan. You should hear a sizzle. Bake for 25-30 minutes – or until a toothpick inserted into the middle of the pan comes out clean. Well Duh #1: You can use a diced medium onion instead of the frozen onion, if you prefer. Well Duh #2: Heating the pan with oil is an old trick. It causes the cornbread to begin to cook immediately and helps give it a more crisp crust. Well Duh #4: If you have a cornbread recipe that you like to make, by all means use it. Make sure your recipe makes a 9X13 pan of cornbread. And make sure it’s a savory cornbread. I can’t imagine crawfish in a sweet cornbread. Well Duh #5: You can eat it plain, but we had ours with a little pepper jelly melted and drizzled on top. Sweet chili sauce would work well, too. Well Duh #6: I used a 10-ounce bag of frozen, cooked crawfish tails. If you have raw crawfish tails, just be sure to sautee them a little longer so they can cook through. They loved it! Not one complaint. A couple even asked for seconds. Will you people EVER let it go?? ?